Some of you will remember Kate‘s father passed away in October of last year. Chris organized the making of a comfortghan for her. 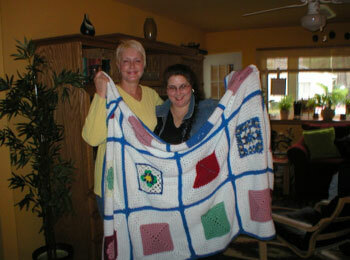 She personally delivered the afghan to Kate a couple of weeks ago, on the first Friday in April. Photo sent to me by Chris and used here with her permission. The folks who participated were Jayme, Rebecca, Chie, Genita, Tiffany, Anna, Chris, and myself. 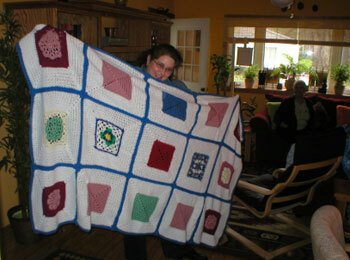 Chris bordered and joined the squares, and she did a beautiful job of it! Chris said we could use any yarn, colors, and square patterns. Because I was working on these squares at the same time as the ones for Ro’s comfortghan, and I liked those squares a lot, I made some of the same for Kate. I used the Friendship Jewel Square and a solid granny square. I left a comment on the 63 squares crochet along. I am doing it now. And signed up at Crochetville. Hope to “chat” soon. Thank you again. It’s absolutely gorgeous. I will always treasure this. Thats beautiful..I love it!!! you all did a great job!!! Thanks for posting the pic’s, Donna! !